Traditional Bhutanese art is not the expression of the artist, but a service to the public, designed to reinforce Buddhist values and precepts. New Bhutanese artists are finding ways to express themselves without forsaking the idea of art as service, a force for social good. A thin fence of woven bamboo leans along a roadside outside the town of Paro. Behind it, a mechanical digger rumbles between mounds of red earth, blue tarps billow in the wind, and two-dozen women, some very elderly, stand in a long trough about 60 cm (24 in) wide, each holding a pole with a sturdy wooden cube at its base. As one, they steadily pound the earth at their feet and sing to keep time, following the lead of a young woman in a baseball cap in a raucous, full-throated call and response. This is the Bhutanese rammed-earth technique, a centuries-old method for building walls in which dirt is packed layer upon layer into sturdy wooden frames. The resulting thickness provides excellent, affordable insulation able to withstand the region’s frequent earthquakes. Traditionally, the pounding is carried out by women while men carry over the raw material, but some traditions can change. On this building site, the only man to be seen is driving the digger, scooping up earth in its hydraulic claw while the women toil with their mallets and songs. From the sound of their laughter and singing, the women are having the better time. This is a one-off job for which they’re working nine-hour days for a daily wage of 600 ngultrum (€8/US$9), good money for a farm worker in the area. The rammed-earth technique is a form of jinzo, or clay arts, and one of the zorig chusum, or 13 crafts of Bhutan, which were first documented in the 17th century, but are probably considerably older. The distinctly Bhutanese aspects of these preserved traditions are now promoted by the government’s Gross National Happiness policies, which deem their conservation a core component of the population’s wellbeing. The zorig chusum, in no particular order, are painting, paper-making, wood-turning, blacksmithing, clay arts, casting, carving, carpentry, weaving, stonework, metalwork, bamboo work and needlework. In Bhutan, people don’t choose to be an artist because they are passionate about art, but because it’s a solid profession. Fifty years ago, the zorig chusum were not only traditions; they were also the backbone of the non-agricultural sector of Bhutan’s economy. Predictably, some of them have begun to fall by the wayside as the country has increased its engagement with the outside world. Garzo, blacksmithing, has all but disappeared from its traditional bases in areas like the Punakha valley, as superior tools, knives and nails arrive from India. It was hard, painful and poorly paid work, and although it is one of the zorig chusum, not everyone regrets its demise as a local industry. Other seemingly obsolete crafts have found new markets in the exponentially increasing numbers of tourists. In Thimphu, guides bring a steady stream of foreign travellers to watch dezo or paper-making in a factory where they can watch workers create individual sheets out of a basin of watery plant pulp, while above them, dancing bamboo rods flex and spring, suspending heavy wooden dipping screens like the fingers of a puppeteer. While crafts related to manufacturing have suffered, those associated with construction have come to thrive. As part of its push to promote a unifying national culture in the 1980s and 1990s, Bhutan’s government issued instructions that all new buildings should be in traditional Bhutanese style. Revised every few years, the Department for Urban Development and Housing’s Traditional Architecture Guidelines for new buildings emphasises the use of zorig chusum techniques. Rammed-earth and shingzo, traditional carpentry, are encouraged but not critical, whereas lhazo, traditional painting, is described in the introduction to the guidelines as ‘mandatory’ (emphasis theirs) on all ‘architectural features’. Because of this rule, traditional painters in Bhutan are almost guaranteed employment in the country’s active construction industry. Even those who drop out after two years of a painting course have skills that make them as indispensable on building sites as an electrician or a plumber. Historically, the only place where it was possible to receive any kind of art education in Bhutan was in a monastery. Sonam Choki’s father received this instruction as a monk, but one day he returned from a trip into the secular world with a wife and was sent out of the dzong for breaking his vow of celibacy. Paradoxically, this made him even more sought after as an artist, as although monks were the only people practised in traditional art techniques, they had high status and spiritual responsibilities that could make contracting them to work on building sites a delicate process. Having seen first-hand the demand for non-monk artists, Sonam Choki’s father started the first government art school in the early 1970s, the second one in 1998, and Choki Traditional Art School one year later, in 1999. That monastic ethos is easy to sense at the secluded mountainside campus of Choki Traditional Art School. A towering golden relief of the founder of Bhutan, the Zhabdrung, Ngawang Namgyal, looms over the entrance near a long line of prayer wheels. The school’s teenage students live at the school and follow a strict daily timetable. After they wake at 5:00am, every minute of every day until lights out at 9:30pm is devoted to work, with the exception of two 15-minute breaks. Two hours daily are set aside for prayer, and as a treat on Sundays, breakfast is served at 8:30am, 45 minutes later than usual. For the first two to three years of their studies, painters at the school work exclusively with natural materials. They learn how to filter mud so that it can be used as a paint that won’t crack, and precisely which part of a cat has the finest hairs for use in paintbrushes (the neck). They work in the lingering stink of boiled cow skins, which release an extract that makes paints weatherproof and keeps colours vivid. On the wall of their studio, samples of pigment are hung up in small see-through plastic bags labelled ‘red mud’, ‘blue mud’, ‘yellow mud’, ‘tea leaves’, ‘rubia stem’ and ‘rhododendron’. This would come as no surprise to Asha Kama, the avuncular figurehead and co-founder of the Volunteer Artists’ Studio (VAST), an organisation started in 1998 by five working artists in order to provide art enthusiasts with the opportunity to develop their full potential. With a membership of around 260 volunteers including photographers, graphic designers, filmmakers, writers, musicians and painters, the VAST centre in Thimphu runs classes, workshops and camps in which an estimated 8,000 people have taken part over the last 18 years. Asha Kama, who punctuates much of what he says with an infectious giggle, is no stranger to the creative block produced by training in traditional art. ‘Opening up a traditional artist is a very difficult thing,’ says Asha Kama. ‘They cannot really conceptualise themselves as an artist. They consider themselves to be a technician or a craftsman, and can only be brought slowly to an understanding that they don’t have to wait for somebody to tell them what to do.’ The teaching he encountered at a British art school during the 1990s, where ‘they dare you to open the shell, open the box’, falls flat with VAST students. 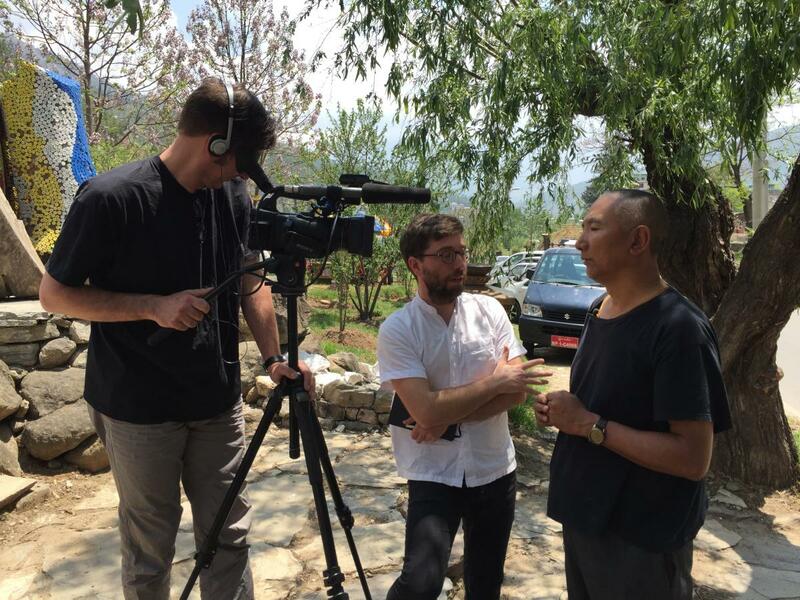 Instead, Asha Kama and his colleagues try to spark artistry by placing students in situations that demand a creative response, specifically, on camps in rural Bhutan with up to 100 participants that last up to three weeks. ‘If you don’t feel any responsibility, how can you create?’ asks Asha Kama. ‘If you have not really understood the situation, how can you express yourself?’ When a VAST camp arrives at a new location, teachers send students out into their surroundings to meet people and learn about the local situation. This might typically be followed by a survey to gather more detail before they devise a project to work with local people to realise some social benefit. Asha Kama says this teaching technique is not new in Bhutan. ‘Our parents didn’t go to school, but culturally we had this process of pushing understanding. Their generation would always connect us to problems, to make us realise how much effort goes into simple things by letting us be a part of it. I remember one day when I was very young my father made me take seven horses with heavy loads to another village on my own. I was proud of myself for doing it and facing the real challenges of being alone with those horses. Sometimes my parents would tell me to take some food to some other people, and when I arrived I realised it was because they didn’t have enough to eat. It was a way of learning. They were giving me a chance.’ Other inspiration springs from the government Communication Division that employed Asha Kama from 1982 until 1997, which would send small, elite teams of designers, writers, photographers, film crews and printers to stay in remote areas for months in order to teach mostly illiterate people about winter cropping and new methods of planting rice. Outside VAST’s centre in Thimphu, blue picnic benches are arrayed under primary-coloured parasols in a small garden between the river and the road. Sculptures by VAST artists—a Sysyphus dressed in a traditional gho struggling under a rock; several tree trunks decorated with bright plastic bottle caps—stand among a small Sunday fair. There is tarot reading, a jumble sale, a painting class, and several food stalls. Three weatherbeaten men are cooking in large pans propped up on rocks over small fires. They are members of some of the 16 families in the small district of Zarbisa Chiwog near Punakha, who are the beneficiaries of the 4th Rice Bank project, for which this event is a fundraiser. People taking part in the Rice Bank project, which aims to break the vicious cycle of debt of rural farmers. A supply of rice is lent to farmers and returned in instalments with no interest after the crop is collected. For Bhutan’s traditional artists, there are no easy ways to resolve the frustrations of traditional constraints, and for Thimphu’s budding contemporary artists, members of the scene admit that they have a long way to go. But the opportunities to self-express have had an undeniable impact on VAST’s young artists. There is the extraordinary story of Chand Bhattarai, who was caught up as a child in Bhutan’s early 1990s ethnic troubles, and lost childhood friends to drug overdoses and street killings. When he was struggling to find himself as an angry young man, VAST offered an outlet for expression and redemption. Today he runs an animation studio that has just completed Bhutan’s second animated feature, a children’s film about a dragon in a gho. Or Gyempo Wangchuk, a painter at VAST who trained in thangka, traditional textile painting, but used the ancient technique to depict his father’s descent into alcoholism and death in haunting detail.